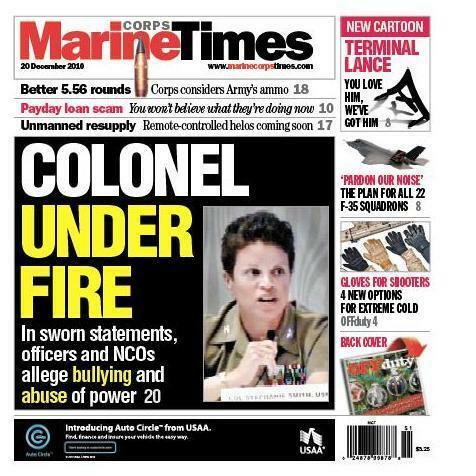 In this week’s print edition, West Coast bureau chief Gidget Fuentes lays out the host of complaints made by Marines about a full-bird colonel currently serving as Headquarters Battalion commander at Marine Corps Recruit Depot San Diego. Col. Stephanie Smith, a judge advocate by training, is a decorated officer and the recipient of numerous judicial accolades over her 23 years in the service. The complaints against her — which include claims made by officers and NCOs that she abused her authority and intimidated subordinates — came to light recently after a former drill instructor filed an appeal of his special court-martial conviction with the Navy Department’s top lawyer in Washington. The Marine Corps Inspector General’s Office also is looking into the Marines’ claims, Marine Corps Times has learned. Check out the complete story in this week’s Marine Corps Times, on newsstands now. Or subscribe here and read it right now. Any Marine in a possition of authority over brother and sister Marines who abuses that power by intimidating those under her is NOT a good Marine Sgt Rodriguez. She might still be if the investigation into those alligations turn out to be false. If substansiated, then she should be forced to retire, after a demotion in rank. Semper Fi brother.